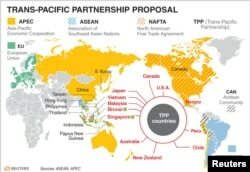 Will the TPP Agreement Cost US Jobs? There was a time when Tracy Warner had everything she needed - and wanted - thanks to the middle class wages from her job at Galesburg, Illinois's Maytag manufacturing facility. Warner took pride in the knowledge her labor made possible the refrigerator that chilled milk or froze ice cream treats in kitchens throughout the United States. But Warner’s job, along with about 1,500 others left the country when Maytag moved to Reynosa, Mexico in 2004. Workers in Galesburg earned about $15 an hour. In Reynosa, workers made about $1 an hour, a considerable savings for the company. The closure also shocked the surrounding communities who depended on the plant for income and business. Since that time, he has studied the pain the plant closure inflicted on Galesburg. That research became the basis for his 2015 book, Boom, Bust, Exodus – The Rust Belt, The Maquilas, and a Tale of Two Cities. 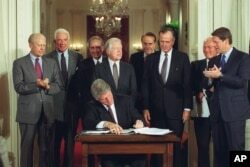 U.S. President Bill Clinton signs side deal of the three-nation North American Free Trade Agreement (NAFTA) at the White House, Washington, D.C., Tuesday, Sept. 14, 1993. “They lost a $60 million payroll; they lost tax revenues for the city. And there is the indirect cost to local business. Really, everybody in that town, it is a town of about 34,000 people, was connected in one way or another to that factory,” he said. Broughton doubts the pending Trans-Pacific Partnership (TPP) agreement, of which many details are still unknown, will be any different. Today, Tracy Warner works twice as many hours working two jobs to make just over half of what she earned at Maytag. She too, has doubts about the TPP. Warner is not alone. U.S. ratification of the TPP agreement faces opposition in Congress, and among presidential candidates on the campaign trail, including former U.S. Secretary of State Hillary Clinton. As the debate over the TPP continues, there are those who live near Galesburg eagerly awaiting its implementation. One of them is Monmouth, Illinois farmer Wendell Shauman. Shauman is the former chairman of the U.S. Grains Council marketing group. He represented U.S. farmers on several trips to Asia before TPP negotiations began. “I’m basically all for it,” farmer Monty Whipple said of the TPP. Shauman said he understands why those who live in and around Galesburg point the finger at NAFTA, but adds there is a greater history lesson to remember. “You go back to the Depression, one of the big reasons that got as bad is it did was everybody put up the walls and tried to isolate themselves and protect our markets - and it caused the whole world to collapse,” said Shauman.